I don't know about you guys, but the end of summer is a little nostalgic for me. It is nice to be able to turn off the ac, open the windows, and enjoy some cooler fresh air, but the fact that fall is around the corner means that snow is not too far away. That makes me want to barf. So in order to soak up the last few rays of sunshine by the pool, here is an easy little tutorial for you. 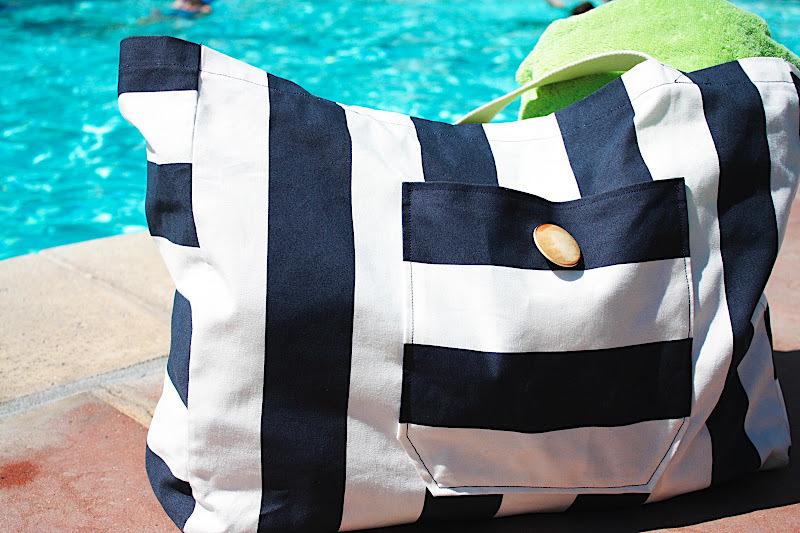 I had looked all over for a great beach bag, but never found one that was big enough. Now that I have a baby, I have twice the amount of stuff to schlep to the pool, so this bag is extra big. I can fit 3 towels, tons of sunscreen, and plenty of snacks and toys in it. 3/4 yard of canvas. I used this great canvas stripped fabric from Ikea. 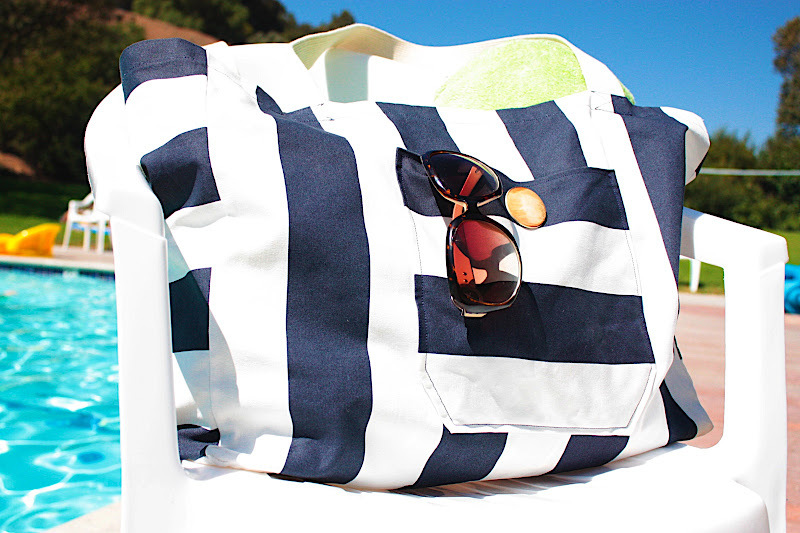 At $7.99 a yard, its quite the steal for a beach bag. 60" of thick rope or cord for the handles. I got mine from Joanns. You can also just use some of your left over fabric. There are 5 main pieces you need to create the bag. A and B - The front and back of the bag. These pieces measure 21" x 17 1/2"
C and D - These are the side pieces of the bag. They measure 7" x 17 1/2"
E - This is the bottom piece of the bag. 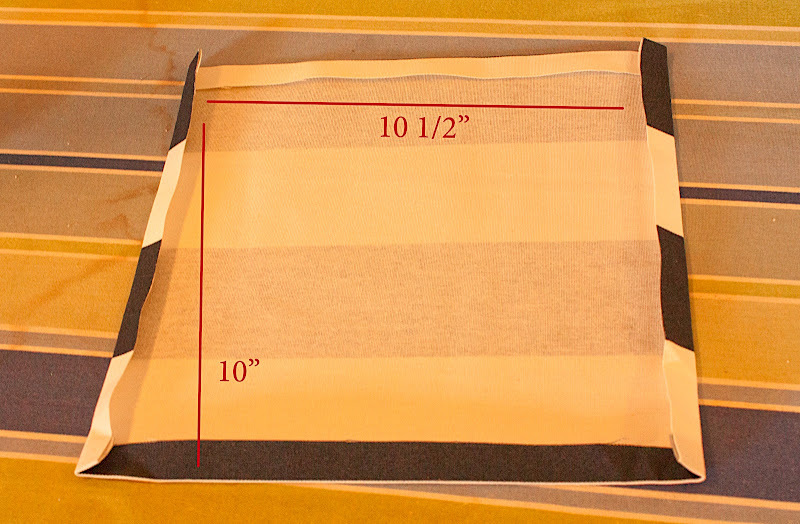 It measures 7" x 21"
You also need a square piece of fabric for the outside pocket. My square measured 10" x 10 1/2"
Step 1: Prep your pocket by folding each side under 1/2" and iron flat. Step 2: Fold the bottom corners of your pocket under slightly, and then refold the corners, to give your pocket a little character. Step 4: Place the pocket in the middle of your front piece for the bag (piece A). I positioned my pocket about 3/4 of the way down the fabric (about 5 1/2" down). Stitch along the sides and the bottom 1/4" from the end. Make sure you leave the top of the pocket open (this is the side you just stitched along the seam). Step 5 - Fold the top of A, B, C, and D down 1/2", and then down another 1" and press. *Note: The top side for A and B it is one of the sides that measures 21" and the top side for C and D measures 7". Step 6 - Now you are going to attach the sides of A, B, C, and D together with 1/2 " seam. This will create the bag, with no bottom attached yet. Sew the right side of A to the left side of C.
Then the right side of C to the left side of B. Then the right side of B to the left side of D.
And then the right side of D to the left side of A. Remember to sew with right sides together. It may sound complicated, but it will make sense once you do it. Then you can surge or zigzag stitch the ends of the seams together to keep them from fraying. 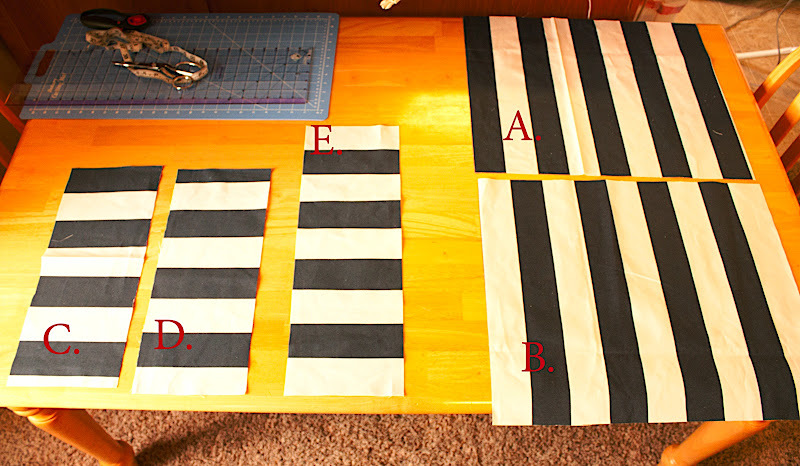 Step 7 - Fold along each of the 4 sides of your bag, and press, to create your rectangle. Step 8 - Pin your bottom piece (piece E) along the sides of the bottom of the bag. Pin them with right sides together, and the wrong sides facing you. 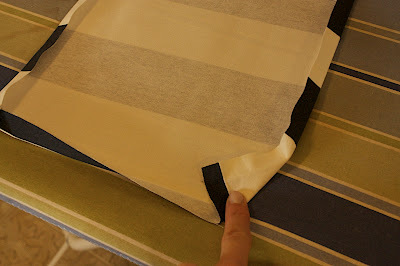 Step 9 - Stitch a 1/2" hem along the sides of the bottom piece, then surge or zigzag stitch the edges. Go slowly when you are sewing the corners, it can be a little tricky to make sure you are sewing all of the fabric, so you don't leave any holes in the corners. Step 10 - Flip your bag right-side out and press the corners to make nice 90 degree angles. Step 11 - Now, cut 2 30" strips of your strap material. I wanted the handles on my bag to be longer so I could hang it on my stroller, but feel free to make yours the length you want them to be. Step 12 - Pin the straps onto the bag, and sew all around the top hem of the bag. When you come to the strap, do a front and back-stitch along the top and bottom of the strap, and make an X in the middle to secure it. Step 13- Hand stitch on your button to the front of the pocket. I opted not to sew a button hole, just so the pocket would be easier access, but feel free to add one if you would like! Step 14- Load that puppy up and hit the pool!